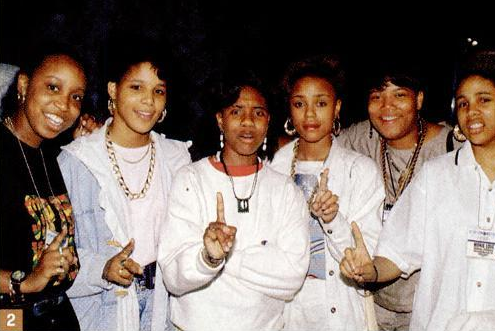 Jazzy Joyce, Peaches, MC Lyte, Michie Mee, Queen Latifah, and Monie Love at the New Music Seminar in 1989. Welcome to another Girl Germs-crafted mix! This time we’re highlighting female rappers—a species of performer that is fascinating, yet rarely studied. Men get most of the credit for laying the groundwork of hip hop, but women like Queen Latifah, Monie Love and Roxanne Shante were right there alongside them (and in some cases, steps ahead of them). In this mix you’ll hear classic American female MC pioneers, as well as some who helped bring hip hop into the mainstream (like Debbie Harry’s rapping in Blondie’s “Rapture”—which gives a shout-out to Fab 5 Freddy) and into genres like dance (Uffie), pop (Neneh Cherry) and indie/experimental rock (Cibo Matto, The Go! Team). Click below to play the mix! If you like lady-centric hip hop you’ll love our next TV Party event at the Red Stag Supperclub in Minneapolis. Join us Monday, May 9 at 9 p.m. for a DJ set featuring the best female jazz, soul, funk, R&B and hip-hop artists from two of our favorite gentleman friends, DJs Phizzy and Marinos Vidiakitis. At 10 p.m. we’ll screen episodes of Living Single, starring Queen Latifah herself. See you there! This entry was posted in Uncategorized and tagged dana raidt, girl germs radio, lady rappers, music by highplainsthrifter. Bookmark the permalink. How have I not stumbled across this blog before?? I’m also a Minneapolitan with much luv for the lady rappers! I made my own playlist last December–you might appreciate it!